Education Zone Improvement Plan visit to ZIP Code 90044, South Los Angeles, John Muir Middle School in Los Angeles Unified School District on the first day of school. 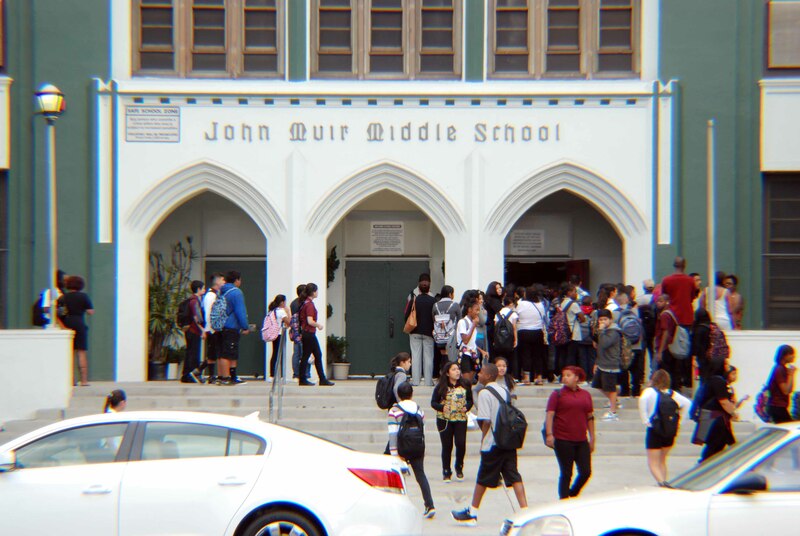 LOS ANGELES — Collegiate Bridges is at the threshold of embarking upon a mission to narrow the achievement gap in the nation’s education system that has been commonplace since the 1950s. Forward-looking statement, result of our mission will be increased self-earned educational opportunities for an entire generation of America’s schoolchildren. The long sought-after solution is not systemic change. Rather, it is a series of paradigm shifts of existing models. Technology that is expanding in functionality, greater capacity, user-friendly and evermore efficient, provides means for paradigm shift in existing models. Never will the case be made, in our mission, for increased spending on kindergarten through twelfth grade education. Our mission will not advocate for policy change. Program modeling features the self-centered student, reaching across parental involvement, community engagement, education system impact, faith-based influence; at the confluence many facets of leadership coming out of as many walks of life as can be imagined. Collegiate Bridges’ far-reaching mission is best illustrated as a map that shows off places nationwide in an Education Zone Improvement Plan. The map is plotted with as many as 43,000 pins, representing locales of millions of productive students who are individually making the mark. This initial paradigm shift transports to education a system with proven efficiencies. “On the Road: People Bridges to People,” the first nationwide project of America, The Diversity Place, brought us to the San Fernando Valley in December 2009. That project resulted in a survey of “Stories of America” and “Multicultural Voices Across the Nation” in each of the 48 contiguous states. Stylized, it is a burgeoning genre similar to what crossover is in the music industry. More than that On the Road reflects inclusion. Inclusion, thinking long distilled by now, catapults over diversity as first of the two higher tenets of America, The Diversity Place. Nearby where this conversation is taking place on ancestral cultural grounds is a silvery lake that shimmers with waves under the sun. Ophelia leads us to a time capsule. Design presentation is mostly glass encased in chrome. The Eastside Sun erected this above ground time capsule for all to see, proclaiming “Save the Date January 2059.” On this day, 2059 is fifty years hence. “What my future husband and I will want for our children is for them to be raised in the Promised Generation,” Ophelia says. “You don’t have to be those things,” she says. “What you must do is identify a paradigm, identify paradigms, create a shift or shifts to resolve a lingering societal problem,” Ophelia says. “You do see,” she says smiling. Smiling again, she says, “Your quest, Man of La Mancha, won’t be easy. Many will not believe what you say or what you are doing. Many more will ignore your generational plan. Some will undoubtedly say your plan is half baked. There will be static. Regardless, you must remain focused while working through reiterations until the plan succeeds. Answering your own question, your due diligence must be sharp to the task. Bring substance to foretelling of the Promised Generation. Collegiate Bridges reflects intricate happenings in time. Causations rendered from particular circumstances. Some would say place and time realities. Beginnings vary, pinpointing the time of your time, as James Baldwin might say. Variations, for sure, but substance and meaning — what may be plugged into the model — are the same. December 5, 1955, Montgomery, Alabama and November 4, 2008, Chicago, Illinois, are portal openings through which the paradigm shift is accessible. The entire nation simultaneously witnesses coming in and going out. Immediately following On the Road, temporary office of America, The Diversity Place was located in an apartment on Schooley Drive in Alexandria, Virginia. Holed up there, the generational plan was drafted. Most workdays began with walks in the middle of the night, 2 miles down Beacon Hill on Richmond Highway and back up, contemplating a strategic plan for missions in education. One of the workday covered President Obama (November 3, 2008) placing the wreath at the Tomb of the Unknown Soldiers. First Lady Michelle Obama was also there for the Memorial Day observance. Another work week covered activities leading up to dedication of the Martin Luther King Jr. Memorial on the National Mall (December 5, 1955). An approaching hurricane caused cancellation of the dedication on that Sunday in August. Dedication was rescheduled for a Sunday in October. Then one day, it was discovery of Amos Alonzo Stagg, the legendary football coach at the University of Chicago. What now is best described as another made plain moment while forming the catalytic element for the paradigm shift Ophelia Meyannal Akna talked about under the sun in East Los Angeles. Stagg served as the University of Chicago’s football coach from 1892 to 1932. In those 40 years, he also coached track 32 years, baseball 19 years, and basketball for one season. In college, Stagg played end at Yale. In 1889, he was selected to the first-ever All-America football team. Stagg is “considered one of the great innovators in the development of college football,” says UChicago’s website. “He helped organize the Big Ten Conference, then known as the Western Conference, and was one of the founders of the American Football Coaches Association.” Stagg led the Maroons to seven Big Ten Conference championships. In those days, college football spread from the east with Yale, Rutgers and Princeton, among others, westward, including Michigan and the University of Chicago, south and westward to Stanford and the University of California. The University of Chicago and several other schools competed to become national powers. How did Stagg reach accomplishments on the grid iron? In a life lived 102 years, there is one biographical annotation not to be missed and that is the introduction of athletic scholarships. Called “student service” payments, the University of Chicago offering athletic scholarships started several years before Albert Einstein published the world’s most famous equation, E=mc2, in1905. Mention of E=mc2 is contextual, subscribes to sound analytical reasoning, and translates into a formula for our paradigm shift, as in Scholarship equals magnitude of athlete performance squared. Representing one paradigm shift is S=ap2. Ophelia’s guidance gained in meaning. She was right. Because of her, Stagg is progenitor of Collegiate Bridges’ paradigm shift. Since then, musings over things to do, survey of things that might fit, at the petitioner request, have been made plain. College athletics, S=ap2, is macroeconomics, so too is Collegiate Bridges, and whatever formulaic that may be arrived at in hindsight. It won’t be as hard to fathom as E=mc2 and will be an easier translation than S=ap2. Conclusion here is not an ending. It’s standing at a vast portal where coming in and going out are in numbers never before seen. It is the time of your time opening that Ophelia urged us to pinpoint to extract meaning. These insights, if not new beginnings, embrace Stagg and a college recruiting system that has been around for 125 years. GP is coming into being. One more thing, launch of the Super Internet Portal puts science and technology on the side of Collegiate Bridges. 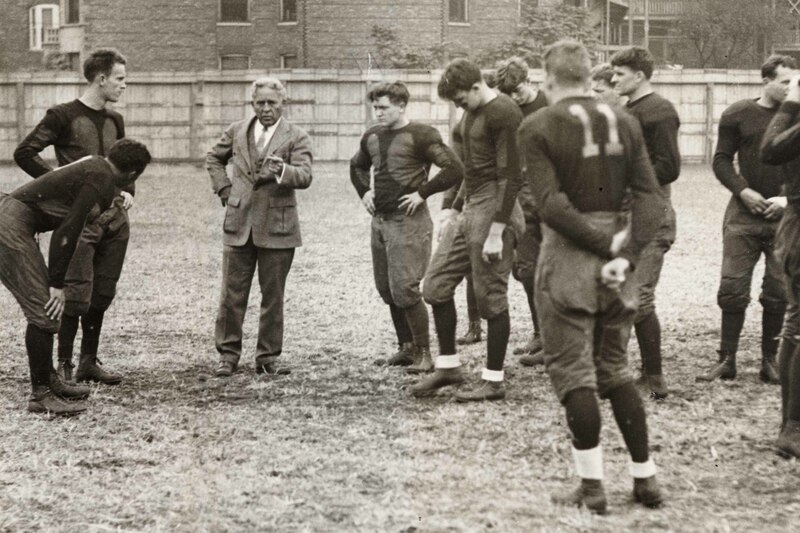 Editor's Note: Photo of legendary football coach Amos Alonzo Stagg instructing Maroons players during practice is courtesy Athletic Department, University of Chicago.